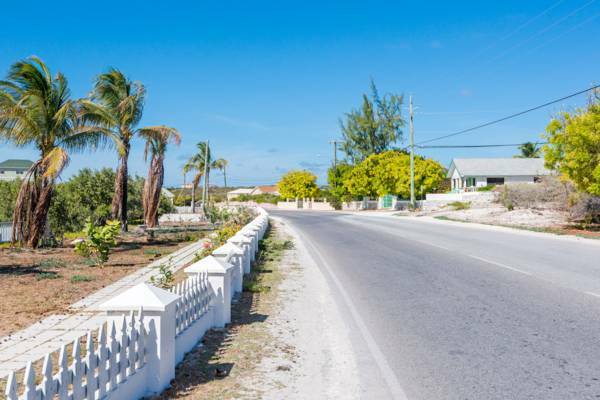 Road junction in Over Back, Grand Turk. The eastern side of Over Back, Grand Turk. The Over Back region on Grand Turk is found north of Cockburn Town and south of North Creek. Largely residential, the area tend to be quiet, and many of the structures are small older residences. Several salinas sourround the region, including North Salina, portions of the extensive Town Pond, and the small Bayle’s Pond Salina. The National Hospital (Grand Turk) is also found here. In the past, Over Back was also known as “The Damp” due to the low elevation and nearby ponds. Adjacent to the Over Back community is the southern interior end of North Creek, and this area hides a few small tidal pond systems which are a haven for birds. A small park and open space takes advantage of this little bit of wilderness. Many of the wading birds common to the Turks and Caicos may be spotted here, including green herons, great blue herons, little blue herons, tri-coloured herons, great egrets, and reddish egrets. Some small bird species can be seen as well, including mangrove cuckoos, warblers, bananaquits, blue-grey gnatcatchers, and Antillean night hawks. The introduced and feral Turks and Caicos donkey, once providing invaluable transport during the salt industry days, can also be seen wandering about and grazing here as well. Last reviewed by an editor on 13 March 2017.